In the previous articles, I described the amount of force necessary to cause a concussion (Part 1), the force levels from a typical blow (Part 2), and other sources of force that can contribute to concussions (Part 3). In part 4, I will describe a set of techniques that will help you to both avoid concussing your friends and avoid being concussed yourself. Fortunately many of these techniques are also important aspects of good fencing in general. They will largely focus on the core mechanics of your fencing and will generally require active practice in order to put into regular use. The number one way to prevent concussions is to minimize or eliminate blows that land hard enough to cause a concussion. As the person delivering the blow, the key to keeping yourself from concussing your opponent is having control over your own weapon and body. Maintaining this control is largely a matter of practice; however there are certain techniques that will make it easier to keep control over your motions, and you should focus on using these techniques. First and foremost,Train good technique regularly. It is important to practice such that your technique is good even when you’re tired. Furthermore, consistency is a product of practice. If your lunge varies wildly in its length, how can you possibly have any idea how hard you’re going to hit someone who is standing within that range? In general, you should hold your body upright and keep your arm and body relaxed and flexed, not tensed. You should also keep your core musculature engaged, tuck your tailbone, and support yourself with your legs planted firmly on the ground. When you are moving, you should push yourself with your legs. Move forward by extending your rear leg and move backwards by extending your front leg. Your shoulders and hips should remain parallel to the ground and shouldn’t rise or “bounce” when you move. Likewise, don’t “fling” your body weight into the motion and allow the rest of your body to follow. In both of these cases, you are engaging in a motion where you spend a period of time falling and where it is impossible to control the placement of your body weight. Maintaining this safe technique is largely a matter of keeping your tailbone tucked, your core engaged, and taking small steps. When striking your opponent, you should be certain to extend your arm completely before the rest of your body moves (without locking your elbow). If your arm is still in the process of extending when you strike your opponent, it is impossible for you to adjust or cushion the blow if needed. As with your footwork, it is also important to push your sword forward rather than punching with it. Your movement should be similar to a waiter extending a tray. Punching and flinging motions are more likely to result in a hard hit because they offer less control over the muscles that are recruited. These motions also strike with a lot of impact force (i.e. with a “pop”), which makes it less likely that the sword will flex. Wistric recently suggested bare-knuckled lunges (with your fist rather than a sword) against a brick wall as a method for testing this mechanic. If this idea gives you pause, then it is likely that you lack control over your technique. If it hurts,then your technique is unsafe (and you’re hitting your opponents that hard over an even smaller cross-section. How do you think that makes them feel?). Cuts should be delivered from the wrist, shoulder, or a sequential combination of the wrist and shoulder (only one moves at a time), not the elbow. 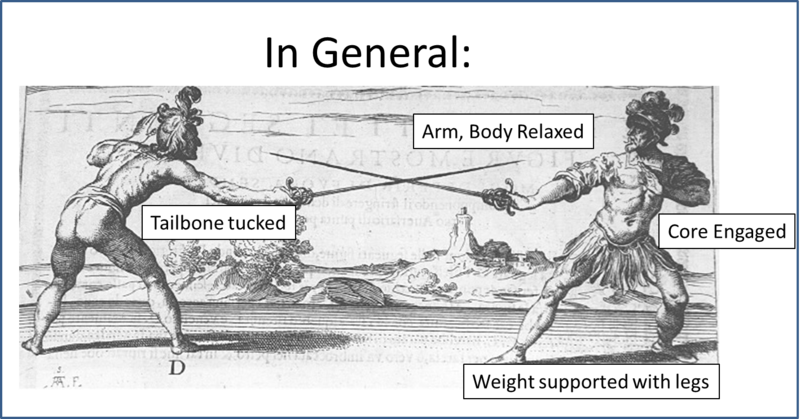 This is better technique for a variety of reasons, however from a safety perspective, this prevents the kinetic linking that is typical of blows from armored combat (but is wholly unnecessary for cutting with a sword). It is important that you avoid using your hips when you cut. Once the arm is extended, reaching your opponent should be performed by moving the body and/or legs. These motions should also be performed by pushing yourself forward. Do not jump. If necessary, you should begin cushioning the blow immediately after impact (If you are striking with a technique that causes it to be necessary to cushion before impact so that you don’t hit too hard, you need to re-read the section on how to strike). As noted above, this will be impossible if you are tensed or if the arm is still in the process of extending. It is best to cushion thrusts by withdrawing the arm in a straight line past your body (i.e. by reversing the motion of the extension). This method will provide the greatest range of motion for cushioning the thrust and removes the weapon from its position between you and your opponent where it can become grounded on your body. Other methods of breaking the force of a thrust such as releasing the ring and pinky fingers and breaking at the wrist in order to carry the weapon down or to the sides can cause the pommel to land ground itself onto your leg or chest which can result in an extraordinarily hard hit if your opponent is falling, slipping, or completely fails to control their body movement. While these situations may not arise due to your actions, you still have the ability to prevent their injury and should do so if possible. Cushioning cuts is simply a matter of breaking the motion at a joint. The best ways to break a shot are by releasing your pinky and ring finger or by breaking at the wrist. These this will limit the mass behind the impact to only that of the sword and hand. This smaller mass should be less than the mass of the head and so due to the relative difference in inertia, it is the weapon rather than your opponent’s head that will undergo acceleration due to the force of the blow. In situations where breaking at the wrist is not possible, breaking the impact at the elbow or shoulder should be sufficient. As fighters, it is also worth considering that there are sometimes blows that you shouldn’t throw even though it would be legal to do so. This is largely a matter of judgement and it is worth considering that it will sometimes be very hard to override your competitiveness in order to protect your opponent’s safety. These situations may occur for a variety of reasons. For instance, if the ground is slippery, you may need to refrain from lunging because you can’t be certain of how you will land. It may also be prudent to change how you target your blows such that you avoid hitting people in the “danger zones” for causing a concussion or to be gentler when striking these areas. For instance, in melees, it might be best to avoid blindsiding someone with a thrust to the temple, even though it isn’t against the rules. Should be targeted for correction. These fighters are a danger to others and, if they refuse to alter their mechanics to correct these problems, they should be removed from the field. While it is important to understand that the blame for a hard shot generally lies with the person who is delivering the blow, there are a number of techniques that allow the recipient of a blow to do so more safely. 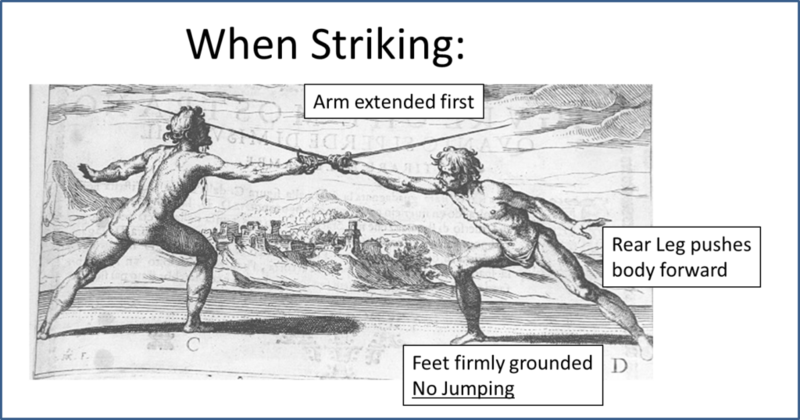 Because of this, it is worth considering that a fencer who consistently fails to perform these techniques is a danger to themself. Awareness – Fencers should be aware of when they’re about to be hit, especially in melees. Fighters who can’t see shots coming cannot protect themselves from injury and should be removed from the field. Brace for impact – When a fencer knows that they are about to be struck in one of the danger zones, it is possible to brace for impact. This can be done by pushing their head into the blow with their neck muscles and by tucking their chin. Importantly, this is an active use of the neck muscles: Do not tense. Keep your eyes open – Train to keep yourself from uncontrolled “flinching” at moment of impact and keep your body relaxed. Never turn away from a strike, as this exposes parts of the mask not designed to take a shot. Maintain good muscular tone in your neck – Your neck muscles are the primary method of resisting impacts. When you are fighting, you should maintain good muscular tone in these muscles so that you can resist impacts even when you are surprised. This is difficult to accomplish, as those who lack body awareness will be incapable of even feeling what this is like. Fighters should engage in routine exercise and practice until they are capable of this. Fighters who are frequently “bobble-headed” are generally failing to do this. Defend yourself – Don’t rush your opponent without defending yourself. Carefully evaluate how you are performing your “heroic sacrifice to take out the MoD” in melees. Avoid “bouncing” footwork, “flinging” your body forward, and “jumping” when you lunge. You will be unable to control your body during the falling portion of these actions and if your opponent strikes you during these motions, your body weight will add significantly to the impact force. Wear a mask that fits – Many fencers have masks that are too large. A correctly fitting fencing mask should result in a slight change of voice pitch. A mask that is too large may in some circumstances, act as an additional lever and make a concussion more likely. Improve your level of Fitness – There are numerous risk factors for concussions that are related to general health and well-being. Smoking, high blood pressure, obesity, unmanaged diabetes, stress, dehydration, and age all place you at an increased risk for receiving a concussion (Because these result in your brain shrinking slightly such that it has more space to bounce around inside your skull). Some of these can’t be helped (you’re not getting any younger), but if you’re worried, you should take care of your health, stop smoking, engage in routine exercise, practice hydrating, etc. Wear a mouthguard – There is some evidence that mouth guards may provide a slight protective effect against concussions for football players. Mouth guards are cheap and might not be a bad idea if you are particularly prone to concussions or getting hit in the face. Do not tolerate dangerous technique – Leave a paper trail when bad things happen. If a same fighter is consistently a problem, deal with them mercilessly. Be aware of your kingdom’s marshallate procedures and policies. If you diverge from procedure, your KRM may be unable to take action. Thank you, Gawin. The lists for marshals/instructors look like good things to watch for in authorizations to determine if the candidate is reasonably safe. Regarding awareness of incoming hits in melee, the standard needs to be that fighters will see *most* hits coming. It’s sometimes impossible for fighters to see every threat in time, especially in a melee where everyone is running, where any blow from the front 180 is considered valid, and where DFB is allowed. In melee, unexpected hits will happen, which is why good calibration is important. Frankly I’m not sure that’s possible, largely due to some of the practical limitations of human vision and attention. The current front 180 degrees rule is a similar figure to the total human field of view, which is nearly 180 degrees horizontally, but that fails to account for the fact that within this field, we only have binocular vision in around 115 degrees, which means that we have very poor depth perception in our periphery. However, our visual receptors are also concentrated specifically in the center of our vision and so while our vision may allow us to gauge depth over 115 degrees, we still might not be able to see with sufficient detail to determine whether a thrust is incoming over this whole range. If you’re focusing on this word, for instance, you probably can’t even read or even make out the words at the beginning of this sentence. This is largely controlled by attention mechanisms in our brain. When we are focusing on something, we generally don’t process details outside of what we are focusing on. If you’d like to give this a try, next time you’re in a car (AND NOT DRIVING IT), stare at the license plate in front of you and gauge how long it takes you to process that their brake lights have turned on. This last bit is really the problem with a standard that fighters should be able to see blows coming; there’s no objective measurement for the size of our field of view and generally fighters who are hyper-focused will have an effective field-of-view that is too small to even see all of the shots that can come from a 1v1 tournament fight while those who are more experienced and more relaxed will be able to easily keep track of a field of view that is larger than 180 degrees (by moving their eyes/head). This tunnel-vision is a large part of why I state that fighters who lack awareness are a danger to themselves on the field. It’s not that they’re being hit by blows coming from extreme angles, it’s that they can’t see any of them at all. In practice, usually these fighters are hyper-focused on the sword hand and are relatively slow to change their focus when the hand moves out of the spot that they were watching. I’ve seen such fighters get surprised by thrusts down the center line that hit them on the nose. By all measurements of human visual field of view, we would expect them to be able to see that shot coming, but because they’re too focused, they can’t. Now, if I expected field-of-view to vary according to a normal (gaussian) distribution, I might agree with you that changing the legal target area might have some effect, but I don’t expect this to be the case. Rather, I expect that there’s a drop-off between average fighters (who probably are at least mostly aware of 180 degrees) and the particularly anxious/unskilled who probably end up with a field of view < 60 degrees at certain times during melees. The average fighters are also more likely to be engaging in other protective behaviors listed above, so I don't expect that changing the legal target area will have much of an effect for them above and beyond the protections provided those behaviors and the behaviors listed above for the person delivering the blow. Thanks very much for the clarification. I mentioned a “standard” because somehow I thought that you expected competent fighters to see “every” blow coming toward them, which I thought was unrealistic; I was arguing for a looser standard than the one I thought you had, but I misread your intention. I don’t think I’ve seen fighters with the kind of lack of awareness you’re describing, so I didn’t know what you meant. You have seen them. I’d say it’s probably everyone on the field with fewer than three years of experience (unless they played a team sport) and a good chunk of the 3-7 year folks (maybe 33%). There are several WSes who tunnel hard and struggle with cooing with crowdedness. Anyone else notice the previous comments have disappeared? Did we have a reboot? I don’t recall seeing any other comments. Do who it was or what it was about? Ah yes. I Was thinking abot the comments on wistrics drills post. Nvm. Oh, did you miss the Facebook discussion on The HEMA Alliance group? I did. It seemed less about not giving concussions, and more about how real men don’t get concussions.